As with many of our worldwide adventure tours a trip to Botswana generally has one main focus and that is the remarkable wildlife that you are certain to encounter. You can expect to see many big cats, predators and massive herds of elephants amongst much more, and we place a huge importance on ensuring that these fascinating and beautiful creatures are protected. We believe that “good” tourism to these parts of the world directly has a very positive impact on the conservation efforts that are in place across the country. By opening up the eyes of people across the world to the ongoing fight to conserve the habitats of the country’s wildlife and by actively encouraging investment in these schemes we can help the people of Botswana to preserve the elements that make this country so unique. As a company we support many wildlife organisations worldwide and we actively encourage our customers to offset any carbon footprint by contributing or donating to the conservation efforts in Botswana including the Save the Rhino and Big Cat initiatives that are in place. 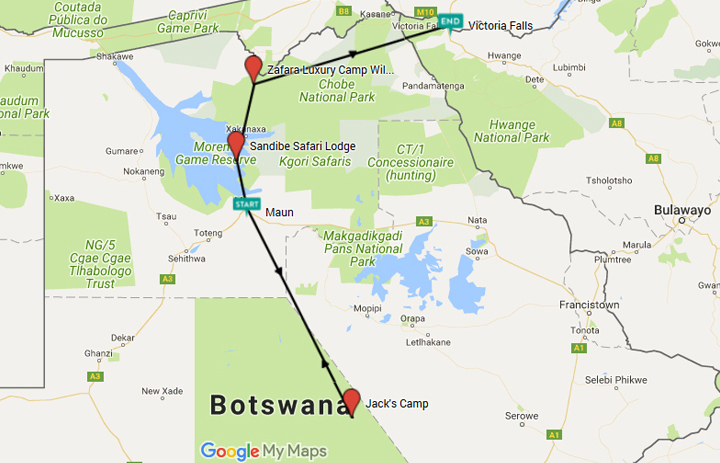 The pre-departure briefing on this tour will also include information on respecting the wildlife which you will encounter, including keeping a safe distance from all wildlife and ensuring not to encroach upon their habitats or do anything which may put the animal under any stress or danger. In most game reserves tourists are not permitted to leave their game vehicles, this is for the safety of both the tourists and the wildlife, and our local partners will ensure that the strict measures in place to conserve the habitats of this wildlife are stringently enforced. Your pre-departure information will also include advice on how to travel in an environmentally responsible way, including responsible use of water, a most precious commodity throughout the areas we will visit, and appropriate waste disposal. We also ensure that all of the lodges and accommodations we use on this trip have appropriate “green” credentials and have policies in place for environmentally friendly operations. For example Zarafa Camp which you will be staying at during your time at the Selinda Reserve is one of the best and most environmentally innovative camps in the whole of Africa. Only recycled hardwoods and canvas were used in the construction and all of the camp’s electricity comes from its solar farm, while ‘bio gas’ plants recycle waste into usable cooking gas. On top of this all drinking water is treated through a UV filtration system allowing for the elimination of the use of disposable plastic water bottles whilst still offering potable water reliably. Likewise the Sandibe Lodge and Tongabezi Lodge both have fantastic processes in place for solar power, eliminating plastic, using biodegradable cleaning products and sourcing locally grown food, cutting down on emissions. On this tour we will be taking some internal flights in order to get to our harder-to-reach destinations, which allows for these areas to also feel the positive benefits of tourism which the more accessible areas receive. Opportunities to fly around the world in pursuit of amazing wildlife and birds makes a few traditional and purist naturalists uneasy because of aircraft pollution and conservation issues, but as conservationists ourselves we defend the conflict between ecotourism and carbon emissions. We believe that the biodiversity crisis is every bit as bad as the carbon environmental crisis and that we can’t possibly promote wildlife conservation efforts if we don’t open the world up to tourists witnessing these remarkable animals up close in their own natural habitat. We find that our clients generally come back from wildlife expeditions with a higher degree of environmental awareness which naturally results in a better understanding and usually a more effective call to action with their own general environmental habits at home and away, often becoming advocates and becoming much more supportive of wildlife and environmental issues. In an effort to further enhance the positive effects of our tours on the wildlife of Africa we actively encourage our customers upon return to donate to charities such as the WWF, Africat and Msaada, charities which we ourselves are heavily involved with. As a company we believe in promoting tourism as a sustainable natural resource with the power to conserve, protect and improve lives, and this is particularly relevant on our Botswana itineraries. Tourism in Botswana is an exceptionally important revenue stream and we take every step necessary to ensure that the tours we provide create a 100% positive impact on the communities of the regions we visit. We ensure that all suppliers or agents that we use to provide the elements of your tour are passionate about protecting the communities, wildlife and landscapes of this remarkable country. The providers that we use are committed to creating and upholding transparent and honest relationships with local communities and suppliers. We use small, local management companies instead of bigger corporations who are based outside of Botswana, so that not only do they hold intimate knowledge of the regions and how to protect them, but also so that as much of the revenue created as possible is filtered straight through to the local communities. The suppliers that we work with work tirelessly to ensure continued revenue streams for local communities and only hire local people. Our agents provide career opportunities that without the tourism aspect would not be possible, and through established in-house training programs, mentoring systems and ongoing training the local people of the communities we visit are encouraged to prosper. We are committed to ensuring that on all of our tours we only use lodges and hotels that have a proven track record of treating staff well and fairly. This is evident in all of the accommodations we use, where staff are happy and well cared for, including the Tongabezi Lodge where generous sums of money have been allocated to the Staff Welfare Committee for use by any staff member with dwindling health. Our providers are also heavily involved in the movement to ensure that more women are employed and can therefore gain the empowerment and independence that comes from this, including having on-site crèches and maintaining fair employment policies. As well as this our partners are continually investing in social responsibility initiatives and support numerous local initiatives including community buses, ongoing investment in local schools and working with the Travel for Impact organisation who in turn support NGO’s that are well governed and have a proven record of providing sustainable and tangible assistance to the communities in which we operate. Solely using local agencies and providers means we have up to date local information and can therefore provide the most relevant information in our pre-departure literature. This includes information on on-going initiatives and community efforts that we actively encourage our customers to become involved in, including schemes to provide school children with equipment, cultural etiquette and advice on how to engage with and help the local communities. We offer first-hand advice on creating meaningful and respectful relationships between tourists and residents and suggest local areas and communities to visit gaining cultural insights along the way, along with advice on where to buy souvenirs (to ensure the proceeds are going directly to the vendors), where to eat & where to drink.